After our pathetic meal at Tavern 17, we headed to one of Giao's old college haunts and ordered a lot of wings. Strapped for time, I made a bad, bad choice. That choice was to eat at the restaurant at the hotel where Giao's friend, B., was staying. This was really a terrible experience and I was embarrased the whole time for having picked the place. The atmosphere was the opposite of authentic and relaxed. It felt like a prettied up Applebee's or something. The waitress, while very pleasant, was far from knowledgable about food or drink. Giao asked if they had any single malt scotches and she replied "yeah, i think we have all of them". They had 3, and not very good ones at that. Also, 2 of the things we ordered, wings and calamari, they were out of. We settled on sliders, which were actually not terrible. We couldn't get out of the place fast enough. I felt like a food fraud the entire time we were there. They had a bunch of different sliders, but we ordered the cheeseburger, the shortribs and the crab cake. They were not bad. Cold and strange and very delicious. The acid really took the edge off of the usually cloying sweetness of pumpkin. Earthy, tender and all around tasty. Sightly spicy, but nothing special. A very good, cheesy version of this classic. Empanadas (tasty), Plantain Chips (not crisp enough), Some sort of weird tortilla roll (forgettable). A bit tough, but the sauce was good. We were at the Penn campus and went on a search for the lunch truck where Giao used to eat quite frequently in college. 10 years later, not only did we find the place, the woman who cooks in the truck remembered Giao. Cheap, and tasty, but the bread was a bit too soft. We went to Ansill with Giao's friend, B, on B's recommendation. It turned out to be a really great find with some interesting dishes. The decor was modern, yet warm and homey. The staff were friendly and casual. The food was, on the whole, very good. They get points for the tasty chunks of salt in the butter that added flavor and a nice crunch. This platter (above) was served with a variety of condiments (below), which were tasty in their own right. A plentiful portion but a fairly standard preparation. I don't remember what fish this was, but it was tender and not too fishy. It matched the somewhat tart salad well. This was probably the highlight of the night. The texture contrast of the crisp exterior giving way to the very tender meat below was awesome and the meat was far from gamey. Sweet and very evocative of spring. Is John's Roast Pork Philly's Finest? Although Giao grew up in Philly he had never heard of John's Roast Pork, who received a James Beard award a while ago. A sandwich shack with a James Beard? We had to try it. In the end, the roast pork sandwich did, in fact, prove delicious, but the cheesesteak was just ok. Since the line for the grill, and hence, the cheesesteak, was infinitely longer than the line for the roast pork, which was already, well, roasted, if you go, go for the roast pork. You'll be stuffed in about 10 minutes total. This was very, very big. It tasted kind of like a really delicious French dip, but you don't have to dip, because the meat juices are already soaking the bread. The meat and the juices very flavorful and thus, the sandwich needed no condiments. Huge and decent, but not great. Better than the bacon cheese steak, surprisingly. The chicken was finely chopped and, at Giao's request, slathered in mayo. Before we got to Philly, we made plans to try Osteria, an Italian place we had heard was great. For the most part, it was pretty great, if a little expensive for Philly. The crust was crispy and wonderful and the octopus was very tender. The bacalao was less salty than usual, which was a pleasant surprise. These were very tasty. This was the real stinker of the bunch. The cabbage was way too bitter. The pasta was really thin and was perfect with the brown butter. The pork was tender and the potatoes were totally superfluous. Earthy, savory and very good. All flavors were delicious and smooth. We went to Fogo de Chao, one of the increasingly popular Brazilian BBQ joints. This one is a chain. Overall, it was pretty good. Some of the meat was surprisingly good. Some was alarmingly dry and/or tough. All in all, we were definitely stuffed in the end. Honestly, we ate so much meat that much of it we can no longer identify. Even so, we've displayed all of our gluttonous pictures below. Parmesan crusted pork and some other meat we can't remember. The raw butternut squash was weird, but the Giao's nephew enjoyed gnawing on it. 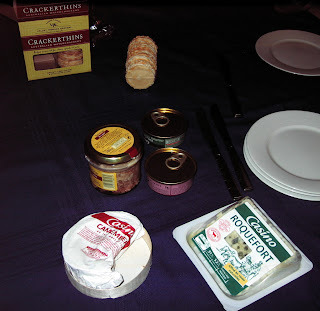 Giao's parents had had some relatives in from France and we reaped the culinary benefits. We had an hour to kill before we got on our red-eye to Philly. We decided on Go Bistro, which seemed our best bet in a rather barren terminal. We'd had drinks there before, but never the food. This was a really terrible dish. The won tons were soggy and the "spicy" noodles were incredibly bland, not spicy at all. This was not terrible, but there was not enough sauce. Too big and not crispy enough, but very, very garlicky. We decided to give Anchor and Hope a try. It is the newest addition to the SOMA scene from the people behind Salt House and Town Hall. Anchor and Hope is seafood based and has a great selection of small plates. We sat at the (very long) bar and enjoyed our tasty snacks. Giao was disappointed to find that they only serve beer and wine, and do not have a full bar. This soup was a bit sweet, but it was very smooth and there was a nice contrast between the tender clams and the crisp corn kernels. This is a very clever name for these fried smelts, which were melt-in-your-mouth delicious. Very, very good. But isn't anything wrapped in bacon delicious? Although these were not as spicy as expected, they were really quite tasty.